Rio de Janeiro might be a city with abundant nature, fed by many streams which fall from the surrounding mountains. However, like many cities across the world, it struggles with water problems, namely pollution and scarcity. The water bodies of Rio de Janeiro and the Guanabara Bay suffer from extensive environmental contamination due to the discharge of untreated or poorly treated sewage into the natural ecosystem. By the time city’s waters reach the Guanabara Bay, they are heavily polluted, carrying solid waste, sewage and microbes dangerous to the city’s ecosystem. 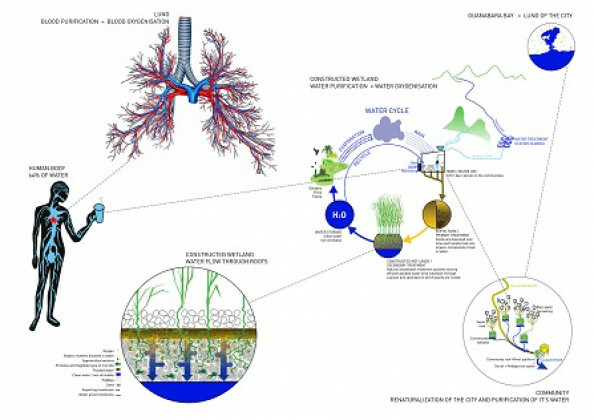 Moreover, 70% of the population of the state of Rio, circa 16 million people, are not connected to an urban sewer network (INEA). The rivers, springing clean from the forests above the city, become open sewers as they flow through it. Approximately 20.000 liters of human waste flows in to the bay every second. The municipality of Rio (and its water company CEDAE) is addressing this issue, through improvement of large scale sewage infrastructure. However, efforts have bypassed hard-to-reach informal and remote neighborhoods. As a result, pollution persists, and these neighborhoods -mostly favelas, housing 6,3 million inhabitant- suffer from high ground-water pollution, diseases, odor and general environmental decline. It exacerbates socio-economic problems by preventing people from work. The dirty and littered environment also leads to violence, low self-esteem and general tension in the urban environment. In Rio, many of the supply and discharge network are not complete. The largest treatment plant runs at 10% of its capacity as a result. In the hard-to-reach communities, the permanent growth, density, violence, topography and remoteness have added another barrier to implementation. There is also a lack of trust between the inhabitants of Rio and authorities. 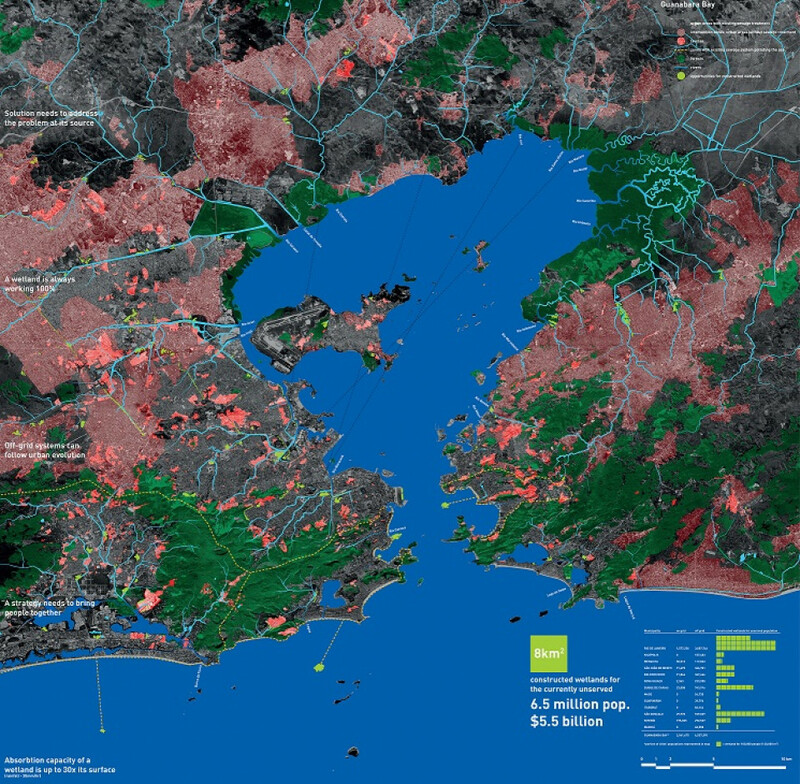 Billions of R$ have been lost “cleaning up” the bay, with no visible results. Inhabitants have lost faith in such large-scale projects, and it’s difficult for actors from top-down and bottom-up to come together to develop feasible solutions that work for all. These are the starting points for the Água Carioca Project, a project inspired by the River Carioca, that gives the people of Rio their nickname: Cariocas. Água Carioca initiated and developed by Ooze Architects, in collaboration with a network of international and local partners, most notably Studio-X (GSAPP), Sitio Robeto Burle Marx and Rio Municipality addresses lack of sanitation, water quality, scarcity and environmental improvement using three scalable and adaptive elements green blue infrastructure -rainwater harvesting, septic tanks and constructed wetlands systems- alongside a community engagement and management model. From 2012 to 2014, invited by the municipality of Rio de Janeiro and supported by the Creative Industries Fund NL, in-depth research about the water situation in several of the city’s informal settlements were carried out. 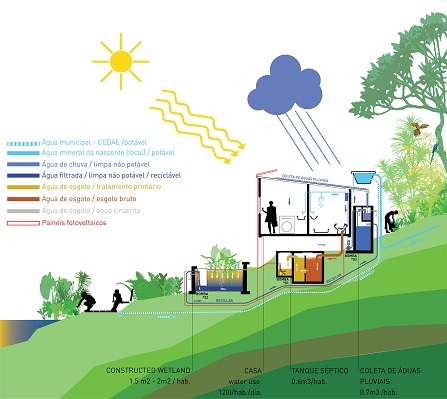 By listening to the many voices of different actors in Rio de Janeiro -activists, municipality, researchers and community leaders- the potentialities of natural, small-scale and decentralized water management systems with rainwater collection and “constructed wetlands” to improve social and environmental conditions were discussed. Engagement and inclusive participation of all stakeholders underpins the Água Carioca. Interviews with a spectrum of top-down to bottom-up actors (from the public sector, to researchers, activists and local residents) were a crucial method to achieve this. 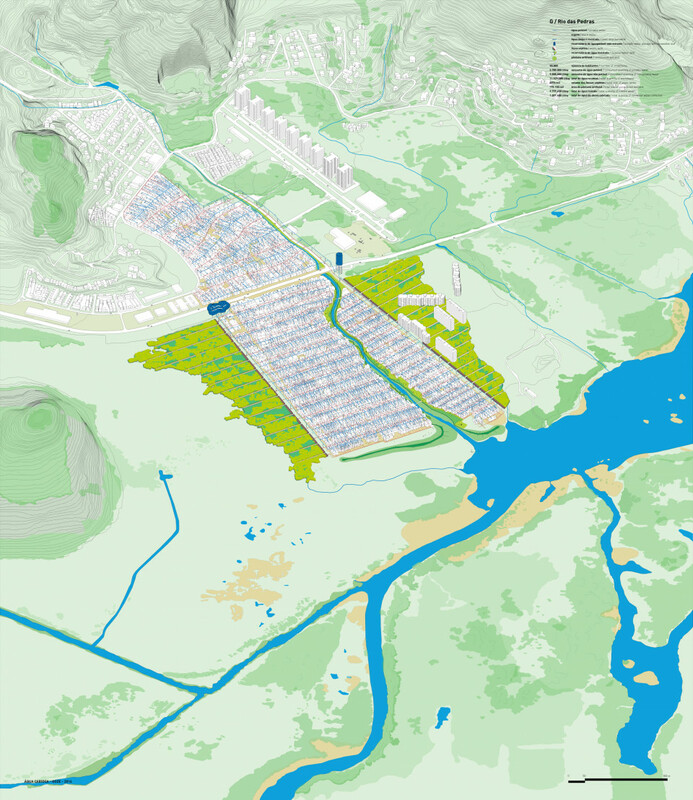 These dialogues informed four design proposals and one city vision on scales ranging from one school building to a whole city district in four distinct favelas in the city: two in the flat lands and two on mountain slopes. In conjunction, the designs demonstrate the flexibility of the proposed system and therefore its potentiality for adaptive, long-term strategies. 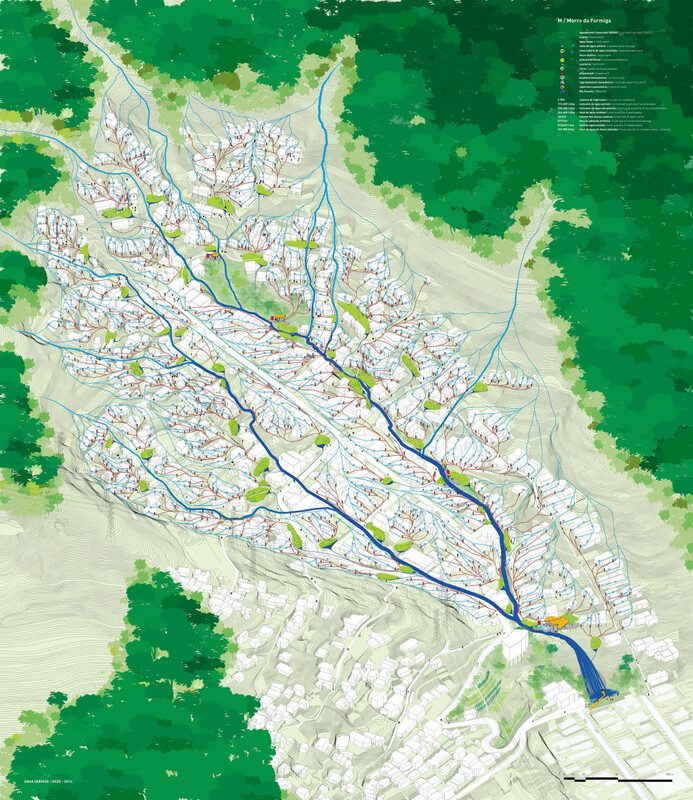 Our solution for water management looks at implementation and integration of these systems into various urban situations across Rio in coordination with local spatial, ecological, cultural and social conditions. These systems are designed to work independently from complex, large scale water management systems. The results were documented in a film and exhibited at Studio-X in Rio de Janeiro in spring 2014. The emerging design proposals and a video were used as tools to understand, combine and reflect on the multiple perspectives. The project becomes a meeting point for previously opposing or distant viewpoints. 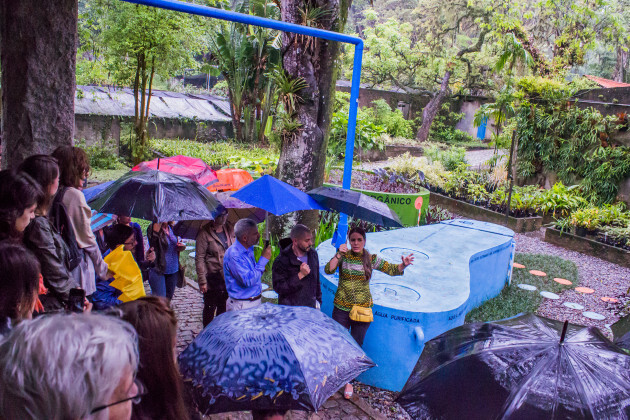 Since 2015, the project team have continued to develop the project, implementing a pilot in Sítio Roberto Burle Marx, holding two further exhibitions and exploring the potential for projects with neighborhoods and public institutions. Realizing the full scale pilot was the most important step so far. It introduced the technology of constructed wetlands “live”, in a way that was attractive for many educational programmes and cultural institutions, from small to large scale, including municipal and state government. It is able to reach a broad public as well as decision makers. 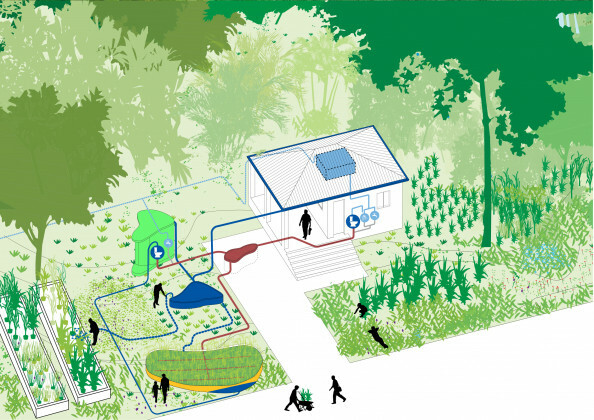 This essential shift from a centralized to a decentralized model uses a series of small interventions to close the loop locally, cleaning and reusing wastewater directly at source, restoring the cyclical processes of nature. With its collaborative, communicative and holistic approach, the project demonstrates a way of working, to enhance acceptance and agreement among stakeholders. A constructed wetland is essentially, a shallow basin filled with a substrate, usually sand and gravel, and planted with vegetation tolerant of saturated conditions. Waste water is introduced into the basin and flows through the substrate, during which the wastewater will come into contact with a network of aerobic, anoxic and anaerobic zones, which via a series of processes can effectively remove the organic pollutants from the wastewater. The climate and ecological conditions influence the surface of wetlands needed per person, its efficiency, the retention time and flow rate. Important factors are the substrate and plant species best matched to the hydrology of the wetland. The warm climate in Brazil is especially favorable for the processes in constructed wetlands. The cleaning process is exhilarated and the size of wetland can be reduced compared with colder climates. It is estimated that ca. 1,2 m2 of wetland are need per person. Constructed wetlands are an effective, proven system in which natural processes remove pollutants from wastewater in a subsurface-flow build-up with no standing water-bodies. This guarantees little chance of human contact with wastewater, no breeding places for mosquitoes, no need for large-scale infrastructural work (lengthy, costly sewers), no transportation of dirty water and 50% less transportation of clean water. Producing clean water and rich vegetation, the ways constructed wetlands are used may adapt to the social, economic and cultural conditions in neighborhoods. They may be implemented in a way that serves primary and pressing needs for clean water solely, but may also respond to practices that relate to the values and norms of communities and traditions that sustain these. It this responsiveness that enhances the acceptance of such vital systems and that requires attention in collaborative design processes. By virtue of their renowned reputation as scientific institution and profound knowledge of plants, the Sitio Roberto Burle Marx is a key partner of the project. They contribute their local expertise on planting for the wetlands, as well as hosting the pilot. The Sitio Roberto Burle Marx is located in Barra da Guaratiba, a West Zone neighborhood of the city of Rio de Janeiro and is the former home of Roberto Burle Marx. He is considered to be the most important landscape designer of the 20th century, world-renowned by his tropical gardens and various means of expression. 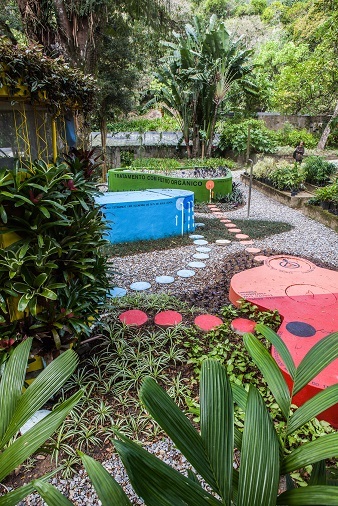 The area houses Burle Marx’s extraordinary plant collection, as well as a large part of his artistic works and his house with its furniture, art collections and personal belongings. In 1985, with the objective of preserving his life’s work, Roberto Burle-Marx donated the whole property to the Brazilian government who since then has been responsible for its maintenance and for fulfilling Burle Marx’s will, by constituting the Sitio as centre for research and learning in the fields of landscape design, botany and conservation of nature. In April 2016 we began construction on a prototype for the Água Carioca system at this place. The pilot is installed next to the guesthouse Roberto Burle Marx built for his brother. The house is located adjacent to the nurseries and the shade houses where numerous tropical species are grown. The house is now functioning as an office for scientists and will double up as a place for artists in residence in the future. The installation is implementing the full cycle of the holistic Água Carioca strategy: An outdoor toilet for the gardeners is connected to a new recycling system, consisting of rainwater collection from the roof of the guest house, a rain water storage tank, a septic tank connected to the new toilet and sink, a constructed wetland and a water tank for the recycled effluent and rain water. The aim of it is to create a pilot that deepens insights into the system’s functioning while making it simultaneously more widely accepted by the general public. Realizing the full-scale pilot was the most important step in the development of the project so far, enhancing comprehension, even among stakeholders who thought they knew the project. At the CIEP School in the favela of Mare, 900 pupils use 15 m3 of water every day. 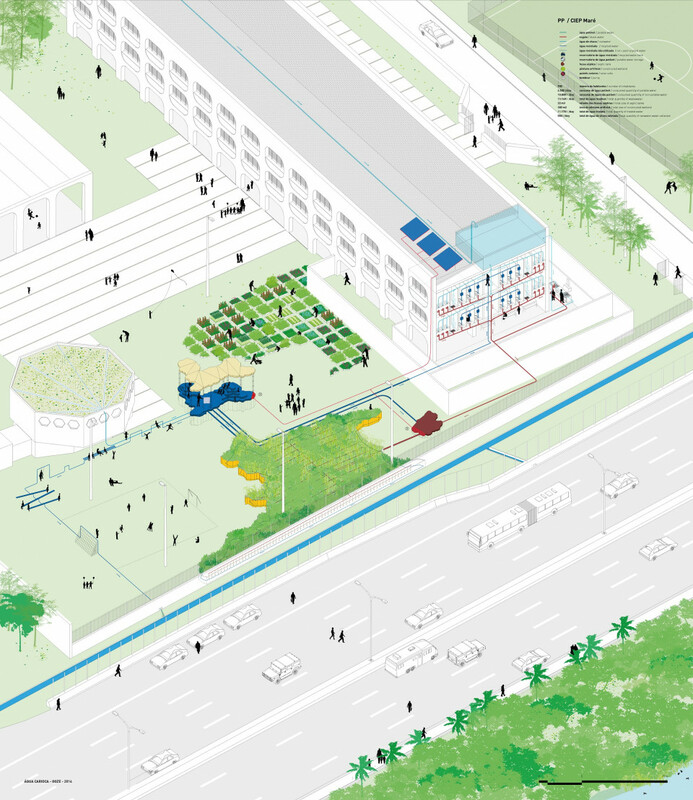 The design proposal for this site combines the Água Carioca system with a communal school garden and outdoor play areas and facilities. Water storage doubles as a pavilion and rainwater harvesting takes place on the roof of an outdoor classroom. The system seamlessly integrates with the existing toilets, ensuring no barriers to using the system. S : SALGUEIRO Salgueiro lies on the steep banks of Tijuca Forest. This proposal takes a community of approximately 160 buildings and 750 people using 106 m3 of water per day. Due to the geography of the location, the design proposal links houses in a chain, with each wetland feeding clean water to those "downstream". The basic elements are adapted to the community context, forming a series of new functional green spaces throughout the neighborhood. 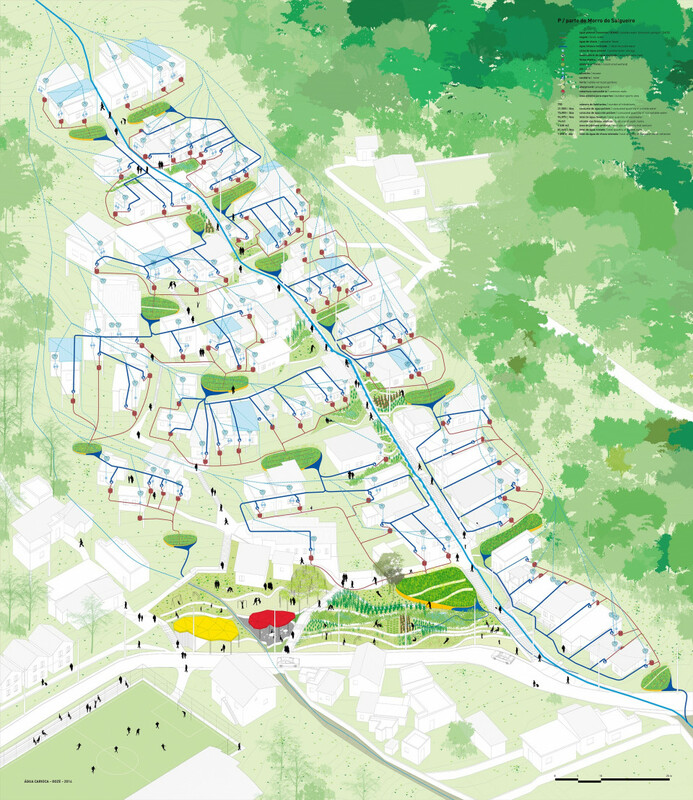 Steep slopes in the lower areas of the neighborhood are terraced to create a new shared community space, with gardens and a wetland and new pedagogical spaces and community facilities such as an outdoor pavilion for events. Morro da Formiga, bordering the Tijuca Forest and Tijuca neighbourhood demonstrates the Água Carioca system applied at scale "M". The Cascata River will have the same quality upon entering as upon leaving the Favela. The river will be swimmable and usable for recreational purposes and most importantly become a shining example of how environmental pollution and river degradation in informal neighborhoods can be reversed. The fields of constructed wetlands will create a green and healthy environment to share public life and repopulate the urban space in front of the houses. They will therefore also contribute to a safer environment. As a side effect, the new terraced landscape acts as a buffer and adds to safety from landslides during heavy rainfalls. It will raise sustainable consciousness and send out positive signals. On a social level the proposal will promote social inclusion and introduce a new culture of recycling water to the Brazilian society that can become an example not only for the city of Rio, but also for Brazil and worldwide. The favela of Rio das Pedras is an extremely dense neighborhood on a much larger scale, lying on flat land prone to flooding. The flow of waste water is directed away from the river, towards wetlands constructed on the periphery of the community. The system again demonstrates its flexibility, adapting to the context and utilising the extensive open space surrounding the built up area. Solar powered pumps are used more extensively to return water to the community for reuse and to feed in to local water courses. This enables the river to recover, eventually becoming a valuable public space, preventing waste water from polluting the Barra Lagoon. Água Carioca explores how this system can be integrated in various urban situations in varying spatial, ecological, cultural and social conditions. It is unique in that it employs the eco-technology of constructed wetlands as a transformative urban planning tool to deliver sanitation and improve livelihoods in a comprehensive, long-term and scalable way. Quick and relatively inexpensive to implement, the system works at multiple scales, from a building to whole neighborhoods and holds the ability to transform an entire city. He studied in Strasbourg (1988-1992) at the ENSAIS and in London at the Bartlett with Prof. Peter Cook. He worked in Paris for Architecture studio from 93 to 95 and in London for Terry Farell and Sheppard Robson from 1997 to 2002. He has been guest critic at the Bartlett, AA, and North London Polytechnic. She studied from 1990 to 1994 in Stuttgart at the Art Academy, and from 1994 to 1996 at the Bartlett in London. She worked at Maxwan, Rotterdam from1997 to 2001 and Zaha Hadid London from 2001 to 2002. 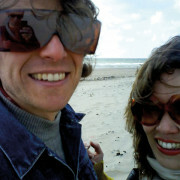 She was tutor and guest critic, at the North London, Art Academy in Stuttgart, and is currently teaching Public Space at the Eindhoven Design Academy (NL).